Also, I'm using a thinner pen this time. It's all a work in progress, so who knows how much my work will change through the years. I'm all about making things easier! I'll throw up a picture soon so you can see what I'm talking about. Hey everyone! Just wanted to give you an update, the NOLA Comic Con. went well. Met some really fun people, RJ and Julia Sevin at Print Is Dead, a very cool imprint of Creeping Hemlock Press, and our booth neighbor Amanda Rachels of Blind Eye Comics. Oh yeah, Andy Kuhn...I got one of his band's (the Fuglees) Cds. We had a give away for the first season of the Walking Dead. Michael had a wheel of death game for people to play. Honestly it was just good to see Michael and Becca again..I think it's been 3 or more years. 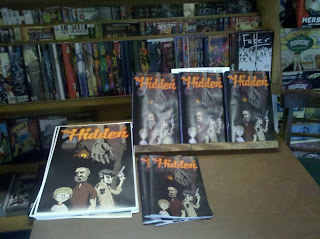 We now have an official website www.thehiddencomic.com Check it out! We are adding one page of The Hidden every week to site, so if you haven't read it this is a great way to do so for FREE. You're just gonna have to tune in every week to get the next page. Also on the site we have a link to purchase issue 1 as well as two posters that we have available. Issue 2 is in progress. Michael has wrote an amazing script and I have started sketching out the panels. Please bare with me since this is a long process for someone with a full time job. I'll keep you posted on how everything is going and post some pictures of the process. I'm hoping a friend of mine (I won't say any names *koffBrentStarneskoff*) will do a short story that we can post too. Ryan Morris draws really weird pictures. He has always wanted to draw a comic book, but his superheroes always looked a little odd. Putting away the thought of a "superhero" comic book, Ryan came up with the idea to write a horror comic that did not involve superheroes. That could have something to do with his fascination with Mike Mignola and Frank Peretti. Even though he wrote the plot, there is no way this story could have been as good as it is without an amazing writer. I'm happy to announce that Michael and I will have a table at the 2011 NOLA Comic-con in New Orleans, LA. The dates for that event are May 14th & 15th. If you live near the NOLA area or have extra $$ for a plane ticket, come check us out. It'll be great just to hang out with Michael in person again and not over the phone or computer. 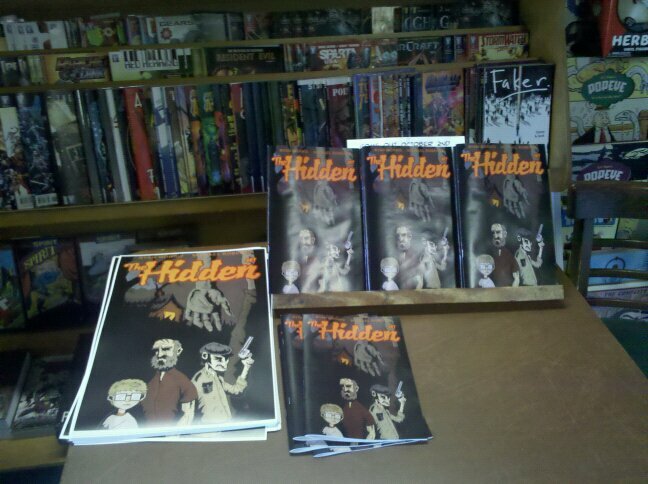 Not only will we have "The Hidden" for sell and to sign, but hopefully we'll be promoting our other story, "Sir Rick the Homeless", which is being printed now...I think. 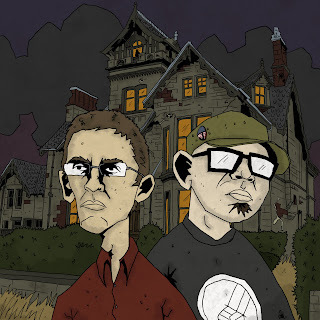 Sir Rick is a short story that we did for a book called "Tales of the Supernatural 2". We're not in charge of this book, so who knows when it will be released. Michael is also working on a story centered around Louisiana that I have the privilege of drawing the designs for. These pictures are definitely pushing my comfort zone...but in a good way; drawing things that I've never drawn before. Soon, I will be posting bios of the creative team for The Hidden. The book signing went great! It was such a good time hanging out with my friend David from the comic shop, signing my book, and picking up stuff to buy....a lot of stuff to buy....at the end of the day the store paid me $4. It was a win win situation for me. Thanks again to David and Charles at Nostalgia Newsstand in Greenville, NC for giving me the opportunity to share my story. I'm currently talking with a comic shop here in Charlotte about carrying the book, as well as Michael is working on getting the book carried in his local shop, and soon you will be able to buy it online.